A safety minister who is determined to see the Health and Safety Executive (HSE) axed. A government that lops “at least” 35 per cent off HSE’s funding. We are living and working in dangerous times. Hazards editor Rory O’Neill warns that if unions, sick and injured workers and bereaved relatives don’t stand up for safety, no-one else will. There’s a lot of ways you can make work more unsafe, and the government’s new safety blueprint champions many of them. It wants fewer accidents reported, small firms to do less on safety, funding constraints on compensation that will prevent occupational disease legal test cases and the cash-starved safety watchdog to take a further, catastrophic, funding hit. FUNNY GUISE David Cameron and Lord Young make light of safety reforms that will inevitably result in more work-related deaths, injuries and ill-health. The approach has changed from a “catch-me-if-you-can” resource-pinched approach to workplace safety enforcement, to an “anything goes” because no-one is looking anyway strategy. A 20 October 2010 email from Health and Safety Executive (HSE) chief executive Geoffrey Podger to all the agency’s staff, following the government’s spending review announcement earlier that day, noted: “The overall position is that we have been asked to make savings of at least 35 per cent in the government's contribution to our budget over the next four years.” This means HSE will lose £84 million off the annual government contribution to its budget by the time the full cuts package takes effect in 2015. That’s not a fat-trimming exercise, that’s life-threatening surgery. It is inevitable preventive inspections will all but disappear, along with the lion’s share of HSE’s respected research and policy functions. Government funds currently make up over 70 per cent of HSE’s annual income. The remaining £100m of HSE’s total budget of £341m comes from charges levied on high hazard businesses. The cuts mean the government’s annual contribution will drop to under £157m, less than half of HSE’s current spend. The new strategy will mean charging more businesses, and giving far less cash and attention for the rest. To maintain the same level of funding by other means would mean having a government health and safety law enforcement agency with less than half of its funds coming from the government. It will mean a government enforcement agency robbed of the ability to make decisions based on rational priorities or need. It’s a watchdog already running on empty. Workplaces are lucky to see an inspector once in a working lifetime (Hazards 110). In 2007/08, less than one in 15 major injuries at work was the subject of any official probe (Hazards 108). HSE prosecutions have more than halved since 2001. Fatalities and work-related ill-health have not. Until the spending review announcement HSE could have been forgiven for thinking it has dodged the bullet. Lord Young’s review of health and safety, which he launched alongside prime minister David Cameron on 15 October 2010, avoided most of the more extreme measures both had mooted in the preceding months, including “earned autonomy” as a route to more self-regulation by firms and measures to “tame” the safety watchdog (Hazards 109). HSE also survived the “bonfire of the quangos”, which will see the Environment Agency butchered and part-neutered and the Health Protection Agency sucked back under direct ministerial control. 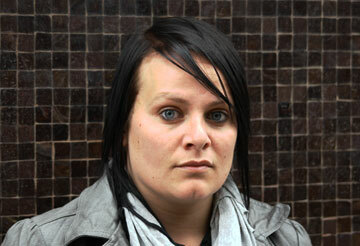 HUMAN COST Mum of two Laurie Swift, 27, lost her partner Alan Winters, crushed to death at work. The 28-year-old crane driver was killed just six weeks before the birth of Alan Jr. Hazards warned immediately after the election the gaffe-prone ideologue, dubbed the Tory “attack dog”, could not be trusted with health and safety (Hazards 111). Grayling’s vendetta against HSE could make all the most damaging ambitions of the Tory health and safety project inevitable. What Lord Young could not justify with evidence in his report – self-regulation, a not so much hands-off as a “look, no hands” alternative to policing workplace safety criminals – may be the only option left to a critically wounded HSE. Spread too thin to any longer pretend it offers a credible threat of a visit and enforcement action, construction industry insiders say HSE’s top management has already prepared a plan to allow major firms to self-regulate, including big industry names with a charge sheet that includes blacklisting and serious criminal safety violations. They believe the most likely mechanism is an external auditing system, the approach that over two decades even the world’s most resource-rich multinationals could not make work in the Corporate Social Responsibility systems used to monitor their supply chains (Hazards 105). HSE, though, denies there are plans to introduce any forms of self-regulation. “HSE has no contingency plans for this purpose,” a spokesperson told Hazards immediately after the budget cut was announced. In the context of the spending review, Lord Young’s recommendations now appear to have been little more than an appetiser served five days ahead of meaty cuts. Still, the TUC branded Lord Young’s report, ‘Common sense, common safety’, a “grave disappointment”. It calls for a relaxed system of accident reporting, measures to address a compensation culture the government itself accepts does not exist and changes to the risk assessment process that do already exist. DANGEROUS LI(V)ES The government says it’s safety reforms are in the name of common sense. But they are not – the savage cuts and downgrading of safety protection are a political project driven by the business lobby and built around dangerous lies. Hazards campaign poster and guide. Under the proposals, all accepted by government, there would be a cost-cutting shake-up of the personal injury compensation system which could make costly test cases on new or contentious occupational diseases virtually impossible. Risk assessment requirements on 'low risk' industries would be revised - although the proposals for immediate action go no further than those provided already in Health and Safety Executive (HSE) risk assessment tools. The recommendation that workplace accidents should only be reportable after more than seven days rather than the current three days plus “does not meet the minimum legal requirements accepted across the European Union”, commented TUC head of safety Hugh Robertson. Still, even the Young recommendations will wound HSE, and another Tory right-wing MP, Christopher Chope has already placed six marker private member’s bills which could push through related amendments to the Health and Safety at Work Act and other measures. Before the election Chope was responsible for blocking a bill to protect the world’s poorest nations from debt sharks. Savaging HSE will be light relief by comparison. 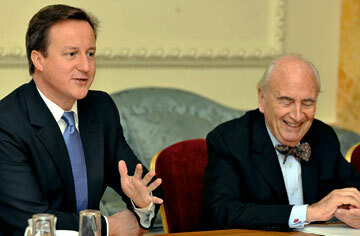 In an indication of the political support for the deregulatory package, prime minister David Cameron sat alongside Lord Young at the launch of his report. Embracing Lord Young’s call for safety deregulation, the prime minister said he hoped the review would prove to be a “turning point”, with a new system being introduced to replace “unnecessary bureaucracy”. Lord Young’s recommendations polarised opinions. Business loved them and unions hated them. DIFFERENT PRIORITIES Industry lobbyists couldn’t contain their glee at government plans to deregulate safety [more]. Unions say David Cameron’s new cut-price blueprint for health and safety will mean more work-related deaths, injuries and diseases [more]. TUC general secretary Brendan Barber put a starkly contrasting view. “The review's recommendations are predictable but a grave disappointment all the same,” he said. He added: “Yet instead of looking for ways of preventing people being killed and injured, the report uncritically accepts the myths and preconceptions surrounding health and safety, and focuses on dealing with a compensation culture which the government accepts does not exist. But Lord Young’s report has to be viewed in a different light when combined with unprecedented and savage cuts. HSE is now under direct instruction from parent department DWP to “design a streamlined health and safety system”. Mr Barber added: “More than a million workers are currently suffering from an illness or injury caused by their work, and last year over 30 million days were lost due to work-related sickness absence. This time off work cost employers £3.7 billion last year, yet much of this could have been prevented if they took better care of their staff. HSE chief executive Geoffrey Podger was left to console his shell-shocked staff. “I very much recognise the concerns that colleagues will have over what is bound to be a significant reduction in the size of the organisation but we will manage this process much better if we proceed in a measured way,” he said in his email address to all HSE employees. Health and safety laws and their oversight by HSE are there for a reason. In the wider world of work, even surviving to the end of the working day has become that bit more uncertain. 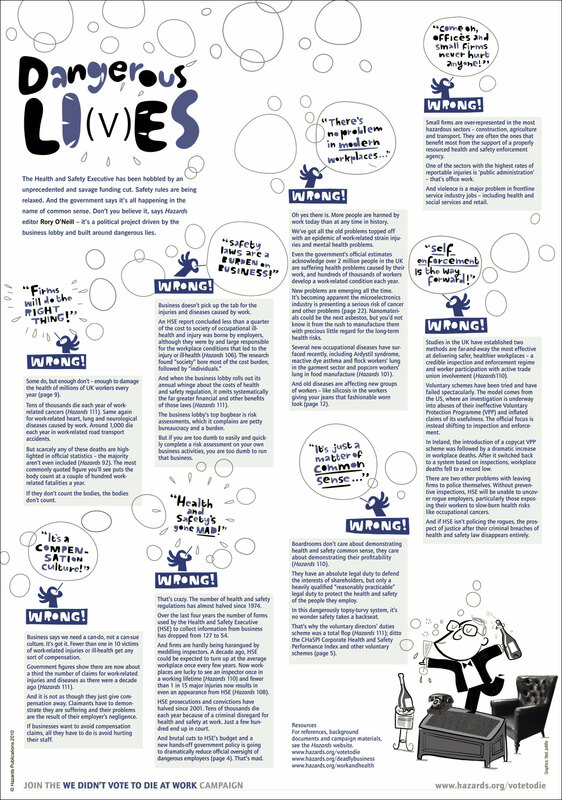 Dangerous li(v)es, a Hazards pin-up-at-work guide and poster [pdf • jpeg] exploding the dangerous lies behind the health and safety deregulation drive. Hazards 112, pages 18-19, October-December 2010. 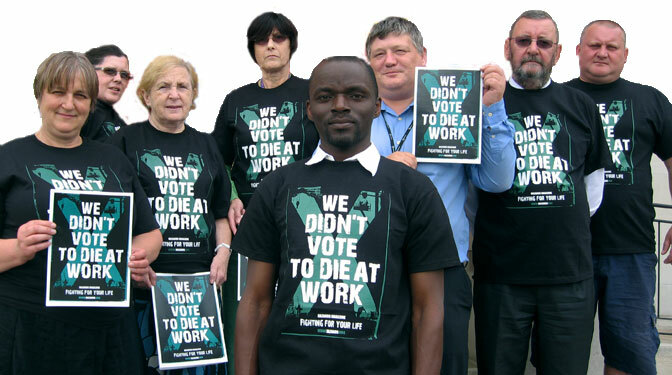 We didn’t vote to die at work: Hazards campaign briefings, posters, resources and facebook group. The case for health and safety: This TUC briefing puts the case for effective enforcement and regulation of health and safety, and refutes the government’s cost-cutting deregulation argument. 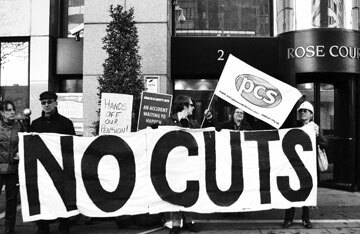 Fighting the cuts to health and safety: Health and safety funding is under threat from cuts proposed by the coalition government. This TUC briefing explains why this must not happen. How to lobby your MP on health and safety: This TUC guide explains how to lobby your MP at his or her surgery on the cuts proposed by the government to the funding of health and safety work performed by the Health and Safety Executive (HSE) and local authorities. Common sense, common safety: A report by Lord Young of Graffham to the Prime Minister following a Whitehall‑wide review of the operation of health and safety laws and the growth of the compensation culture, HM Government, October 2010 [pdf]. Chancellor’s statement on the spending review, HM Treasury news release, related news release on cuts to the DWP budget and Spending Review webpages. The number of people harmed by their jobs increased by 100,000 last year, according to official figures, while the number of prosecutions and convictions reached a record low. The new statistics have prompted a warning from TUC that workplace injuries and diseases could increase as the Health and Safety Executive (HSE) struggles to cope with unprecedented budget cuts. HSE figures for April 2009 to March 2010 say 1.3 million current workers reported they were suffering from an illness caused or made worse by their work, up from 1.2 million in 2008/09. HSE said 555,000 of these cases were new illnesses occurring in-year, a 4,000 increase on the number of new illnesses recorded the previous year. A further 800,000 former workers claim they are still suffering from an illness caused or made worse by work. Both prosecutions, down to 1,026 cases, and convictions, at 735 in the year, were at a record low. The use of HSE enforcement notices, which do not result in an employer making an appearance in court or receiving any penalty or bad press for criminal breaches of safety law, increased from 8,079 in 2008/09 to 9,734 in 2009/10. Would you trust this man with your safety? A member of parliament referred to in the press as a Conservative Party ‘attack dog’ and who before becoming an MP worked for a union-busting PR firm that creates front organisations for polluting industries is the new health and safety minister. Chris Grayling is now minister of state at the Department of Work and Pensions (DWP). He reports to DWP secretary Iain Duncan Smith. 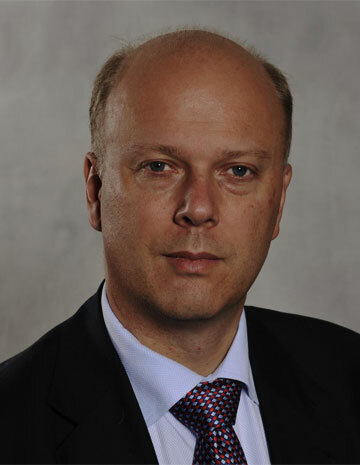 Mr Grayling, MP for Epsom and Ewell since 2001, was previously “a director in the Employee Communication practice at international communications firm Burson-Marsteller. He ended his time there as the firm's European Marketing Director,” according to his website. Burson-Marsteller is one of the more high profile “union busting” firms and has acted on behalf of asbestos, tobacco, nuclear and chemical firms on regulatory and compensation issues. It is also regarded as a pioneer in the creation of ‘astroturf’ organisations, supposedly grassroots lobbying groups like the ‘Foundation for Clean Air Progress’, which was set up by Burson-Marsteller using funds provided by the petroleum, trucking and other polluting industries. Source: Abuse of power, Hazards, Number 111, July/September 2010. While the unions representing the workers on the rough end of Lord Young’s safety reforms have been dismayed by the new government-approved plan, the business lobby by contrast has been equally united in its praise for the measures to pare back safety protections. While generally welcoming the government cuts package, the business lobby has so far remained silent on the impact of a 35 per cent cut in HSE’s budget. It will however make many of the demands of business – particularly a desire to receive less attention from HSE – a reality. Safety standards at work will be damaged as a result of HSE budget cuts and Lord Young’s recommendations on reform of the UK health and safety system, unions have warned. Mike Clancy deputy general secretary of Prospect, a union whose membership includes 1,650 HSE inspectors, scientists and other specialists, said: “Despite earlier misgivings, we greeted the government’s recent report into health and safety with some relief after Lord Young’s conclusions clearly recognised the strengths, sensitivity and professionalism of HSE’s approach and strategy. But even before the cuts announcement, many unions were expressing alarm at the potential damage from Lord Young’s proposals alone. Grahame Smith, STUC general secretary, said: “This is clearly a missed opportunity for our health and safety system to be reviewed to help trade unions and employers face the challenges facing workers in the future”. She also rubbished Lord Young's figures on the numbers affected by work-related injuries and ill-health, pointing out that every year up to 1,500 workers are killed in work-related incidents and up to 50,000 die every year due to illnesses they had developed because of their work.